Since 1998, NEADS has organized twelve Disabled Student Leadership Forums across Canada. These events have been held in Montreal, Ottawa, Calgary, St. John's, Antigonish, Yellowknife, Winnipeg, Toronto, Victoria and Vancouver. 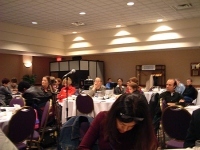 Two meetings have taken place in Calgary and Montreal, while project workshops were held in Ottawa in conjunction with the November, 2002 national conference and a full day forum took place on September 26, 2003 at the Delta Hotel. This report is based on the proceedings of the third NEADS Student Leadership and Employment Forum of 2003, which took place on Friday, September 26th at the Delta Ottawa Hotel and Suites. The event was attended by about 45 students and graduates with disabilities, service providers, and industry representatives. Participants were from local colleges and universities including Carleton University, University of Ottawa and Algonquin College. Steve Estey provided welcoming remarks, while NEADS' Ontario Representative Jason Mitschele acted as Chair for the day-long forum. We were pleased to welcome representatives from other non-governmental organizations as speakers at the event and also as participants in the group discussions. Representatives from both Line 1000 Placement Services and the Neil Squire Foundation were in attendance. Canada Post Corporation sent two members of its equity and diversity team to observe the workshop presentations and to participate in the small group discussions. Health Canada had three representatives from its team, including speaker Mario D'Arcy. Jennison Asuncion, Manager of the NEADS Web site, also participated in the forum. In keeping with the format of the 2003 NEADS Student Leadership and Employment Forums, the first half of the day concentrated on issues of student leadership, while the afternoon discussion focused on employment-related issues of relevance to students with disabilities. In the morning, participants were treated to presentations by panelists Chris Gaulin and Michael Sanford of the NEADS' CampusNet project team; Shaun Vollick, Coordinator, Carleton Disability Awareness Centre; Mahadeo Sukhai, Vice-President Internal of the Graduate Students' Union, University of Toronto; Desiree Villeneuve, President, Association for Special Needs, University of Ottawa and Bill Holder, Staff Lawyer, ARCH. Speaking in the afternoon on the topic of employment were Maryon Urquhart, Director of Customer Relations, Ability Edge/Career Edge; Susan Forster, National Project Manager, Navigating the Waters, Canadian Association of Independent Living Centres; Stephen McDonnell, Recruiter, People With Disabilities, BMO - Bank of Montreal; Mario D'Arcy, National Recruitment Director, Health Canada; and Michael Hendricks, Assistant Executive Director with Lana McGee, Youth Employment Counsellor, Line 1000 Placement Services. The Ottawa forum also featured displays from Canada Post, Bank of Montreal (BMO), Ability Edge/Career Edge and the federal government's Science and Technology Ability Recruitment/ Retention (STARR) initiative. Jason Mitschele welcomed participants to the NEADS Student Leadership and Employment Forum, and invited Steve Estey to speak. Steve Estey explained that in his capacity as project consultant with NEADS he has met with students from Vancouver to the East Coast to the far North. Prior to launching this forum, the only opportunity for students to meet together was at the national conference held every two years. The NEADS Board of Directors wanted to find a way of bringing students together to discuss common issues and concerns, and to network. As the forum evolved, it became apparent that students were interested in both leadership issues and in getting a job. "What started out as a forum on leadership has evolved into what we now call the Leadership and Employment Forum," explained Estey. "This gives you two workshops for the price of one." The morning panel will discuss student leadership issues and the afternoon panel will focus on employment and supports for students with disabilities. "We have noticed that a lot of the skills and talents we look for in the disability community are the same thing that employers look for," said Estey. Shaun Vollick provided a brief introduction to the Carleton Disability Awareness Centre (CDAC), utilizing an excellent Powerpoint presentation. He explained that Awareness Carleton, which started NEADS in 1988, was instrumental in starting the CDAC. It was the first on-campus organization run for and by students with disabilities. Now completely student funded and operated, CDAC is a CUSA (Carleton University Student Association) service centre with two coordinators and eight student employees. CDAC provides confidential information in a comfortable, safe environment; advocates for people with any disability; and coordinates with the Paul Menton Centre - the university run service centre. It offers a variety of free services including: emergency wheelchair repair, tunnel cart transportation, an accessible Web site, advocacy, peer support, a comfortable lounge and adaptive technology. Shaun said that CDAC runs sports and leisure programs, publishes a monthly newsletter, and offers wheelchair repair and tire fill and replacement services. Its lounge is equipped with two computers that have access to Dragon and Duxbury, a Braille embosser, adaptive phones and technology, daily newspapers, free coffee and tea, and a microwave and refrigerator in an accessible space. CDAC is also starting a note-trading service for a fee. The main project underway at present is the yellow sign campaign designed to let students know how much it costs to replace damaged door openers. CDAC also sponsors awareness days and weeks to raise awareness of barriers, and hosts movie and social nights, and outings. "Have you ever wondered where you can find friends like you, or when friends can hang out?" asked Desiree Villeneuve, explaining that the Association for Special Needs is "brand new" at the University of Ottawa. Created last March, the Association now has a Web site and is actively looking for members. A social gathering will be held on October 4. The Association receives no funding from the university, so it charges a $5 membership fee. It hopes to hold a referendum to secure funding and a permanent location. The Association advocates, promotes communication between students and the university, holds meetings to provide support to students with special needs, and raises awareness on campus. The Web site (www.asn.tibbs.ca) provides information on ASN Meetings, courses, disability accommodations, and in the future, hopes to provide a link to job opportunities. Villeneuve encouraged "those of us who struggle daily to accept our blessings." She explained that she used to despise her hearing impairment, but that without it, she would not have developed into the "great person I am today. It has changed my perception of the world at large." Through her activism and her involvement in this Association, she had had wonderful opportunities to meet others with disabilities. "This Association is a great place to find information, and to participate in social events," she said. "Join ASN!" ARCH is a legal clinic with a provincial mandate, said Bill Holder. It offers a summary service over the telephone, has a Web site (www.archlegalclinic.ca), and produces a newsletter. As well as providing advice and a referral service, ARCH engages in law reform work to effect positive change, promotes public legal education on human rights law, and undertakes test case litigation. ARCH will get involved in a new case it thinks will set a precedent. The Supreme Court of Canada will hear two or three cases next March that will affect people with disabilities across Canada. ARCH gets involved in cases like these. Holder explained that the Human Rights Code is the source of rights within education for students with disabilities. Post-secondary education is considered a service. Students have the right of freedom from harassment, and freedom from reprisals for lodging a complaint. A distinction is made between direct and adverse effect discrimination. Direct discrimination is seldom seen. Adverse effect discrimination is to not provide services; it's discriminatory and is against the Human Rights Code. Holder said that the expression "reasonable accommodation"-assisting someone to do something in a different way-does not exist legally. The right to accommodation is the right to what is reasonable up to the point of undue hardship, defined as cost, outside sources of funding, and health and safety concerns. In most cases, said Holder, decisions come down to a case of cost. There is no magic formula to the accommodation process-each person is different, and each case should be approached on an individual basis. The accommodation provided should be the one that is the most respectful of a person's dignity. Holder encouraged participants to keep a paper trail of any accommodation they ask for. If refused, the student should tell the university that this is a right under the Human Rights Code, as is the right to be free from reprisal for asking. If unsuccessful, there are resources available on most campuses to help, said Holder, cautioning that the student must exercise his or her quasi-jurisdictional rights within six months of the refusal. "Get your complaint in sooner than later," he said. "If you are getting the run-around, remember this-you might be too late to launch a complaint." Ontario, which used to have human rights commissioners and offices in every city, now only has one left, in Toronto. "You will have to contact the commission and make the complaint over the phone. They will send you a written form to fill out and send back." The commission will try mediation in the city in which the complainant lives. Mediation has a good success rate; often when the university receives a written complaint it makes an effort to settle. However, in the case of a recalcitrant university, the process can take as long as three years to investigate. Holder emphasized that students should still proceed with complaints despite the time delay: even though the student who lodged the complaint could be finished university, the decision will benefit many others to follow. In response to a question, Holder said that complaints on the basis of disability comprise 66% of all complaints. Very few get through to the tribunal, as most are resolved by mediation. "Expect to win," he told the students. "A university will have a difficult time proving an undue hardship defence. Adjudicators are not sympathetic." Also, most universities want to avoid a "black eye" and the ensuing public relations nightmare. Mahadeo Sukhai, a fourth-year PhD student conducting leukemia research, described the evolution of the student movement at the University of Toronto, the integration of disability and access services, and the university's response to the Ontarians with Disabilities Act. In the summer of 2001, Sukhai and the coordinator of accessibility services at U of T "hashed out" the Accessibility Services Advisory Committee (ASAC), with representatives from all three student governments on campus, and membership in NEADS. Students for Barrier-Free Access (SFBA) was formed in 2002. In December 2002 the Graduate Accessibility Committee (GAC) was formed, and earlier this year, the inaugural chair of the SFBA assumed the position of VP-Equity at the Students' Administrative Council (SAC). The following month Sukhai, the inaugural chair of the ASAC, assumed the position of VP-Internal of GSU. The Canadian Federation of Students passed an accessibility policy in August 2003. "It was difficult to do what we did at U of T-create a movement from scratch," said Sukhai. No comprehensive database exists of the number of students with disabilities, but estimates place the number at 2% of the 67,000 students based on those registered with the service centres. Sukhai noted that the key to a successful student movement is the involvement of students and student governments. The SFBA needed access to students with disabilities and resources for them. Its formation legitimized recognition by the Office of Students Affairs, and provided funds to the organization. Membership recruitment is ongoing, both by personal invitation and by orientation sign-up sheets. The SFBA is trying to make inroads into the Association of Part-time Undergraduate Students (APUS) in order to have a unified voice on accessibility issues. Integration puts access issues on a common agenda and helps to build a network for the long term. "This has given us a chance to expand our influence, that would not have been possible had SFBA been working alone," said Sukhai. The Ontarians with Disabilities Act (2001) has laudable goals, said Sukhai, but there is no mechanism for enforcement, no penalties, and no timelines attached to it. Furthermore, the Act is ageist, skewed toward acquired disabilities, focused on physical barriers, and based on the medical model. Sukhai noted that he much prefers the WHO model. The U of T's ODA Committee agrees with the viewpoint expressed in one of the quotes Sukhai showed participants: We have an opportunity here to make a statement about our commitment to accessibility and universal principles. Let's use it as best we can. Musing about why this work should be done for so few people, Sukhai noted that it is always more cost effective to plan for accessibility rather than retrofitting older buildings-for example, it will cost $1.5 million to put an elevator in Hart House. As well, benefiting the minority benefits the majority. With an aging staff, U of T must consider age-related disabilities. Much of the planning for this disabled students movement took place over the summer months, with no funding. The ensuing plan will be put through a cycle of governance that began last month. Nine subcommittees have been formed to tackle various aspects of accessibility, and a coordinating committee was struck to oversee the development of the plan. The 71-page ODA Plan is the first document to bring together all previous accessibility initiatives at U. of T. The Plan does not ask for any financial resources-it's a way of doing more with less. The student conference "Breaking Down Barriers 2003" will be held at U of T in November. Sukhai encouraged all participants to attend the day-long forum. Registration and contact information can be found at http://individual.utoronto.ca/sfba or sfba.uoft@utoronto.ca. CampusNet is an online collaborative community that brings together student leaders from across the country. The project staff includes Jennison Asuncion, Chris Gaulin, Michael Sanford, and Frank Smith. There is an advisory committee made up of student reps from across the country and two partners- the Adaptech Research Network and the Quebec Association for Disabled Post-Secondary Students (AQEIPS). The Office of Learning Technologies, Human Resources Development Canada is the funder of the CampusNet initiative. The first of the CampusNet activities were presented at the 2002 conference. "Our work was just beginning," said Gaulin, noting that improvements are continually being made. CampusNet has developed a new directory of student groups and organizations; students can search by province, student unions, etc. Staff have developed training packages for student groups to develop their own accessible Web site, and finally, the employment aspect of CampusNet has expanded. Broken into subject areas to help guide the conversation, CampusNet Café provides a bulletin board for student discussion. NOW does have some limitations, however, said Gaulin. It's a channel for employers to find potential candidates, but should not be the only one-its not WORKOPOLIS. Employers cannot search within resumés to find candidates; they have to download the resumé to find more. Gaulin displayed an example of a page with job postings. CampusNet can be found at www.neads.ca/campusnet or www.nows.ca ; by e-mail campusnet@neads.ca; toll-free, 1-877-670-1256. Asked about CDAC's relationship at Carleton University with the Paul Menton Centre, Shaun Vollick said that the Paul Menton Centre is geared to academic needs, while CDAC concentrates on other needs such as recreation and leisure. "We try not to compete with them," he said. "We advocate with them, and we have a good rapport with them." Desiree Villeneuve said that ASN also works with the campus disability service centre at the University of Ottawa. The Association is designed as a social and larger advocacy group. A participant asked about human rights law in Quebec. Bill Holder replied that Quebec Charter of Rights is analogous to the Ontario Charter of Rights. A distance student from Athabaska University asked if any thought had been given to having students from other institutions network with one another. Desiree Villeneuve replied that ASN was definitely open to meeting with and providing information to people from other universities. St. Paul's University is in the process of setting up something with ASN. Shaun Vollick said that anyone can participate-CDAC offers its services to anyone in the community; however, sometimes it has to charge an extra fee because its money comes from student fees. Vollick said that a student from another school could use the adaptive technology at CDAC, but Carleton students have first priority. A participant asked Bill Holder about smaller employers that claim undue hardship. Holder replied that the same test applies to all employers, but conceded that it might be easier for smaller organizations to show undue hardship. However, the threshold is purposely held high. The public policy behind the human rights code is to promote inclusion and break down barriers. Are good team players, able to delegate so that the organization continues after them. In a school environment, some might be too busy with schoolwork and commitments. The person with a disability might be already involved in an organization outside the university. Some might feel uncomfortable, or feel that they have no skills to offer. Some don't want to self-identify as having a disability. Be flexible-allow different levels of membership like bronze, silver, and gold. Provide a list of participation choices for the member. Some people might be intimidated about the thought of becoming president, but would be willing to work in another capacity. Exposure to a diverse population: ages, ethnicity, persons with disabilities (and different disabilities), faculty, etc. Create an institutional framework that every student can access. This accessibility plan will analyse the structure of buildings on campus and create a plan of action for the future. Create a policy for equity and access. Institute an implementation plan with concrete benchmarks. Ensure that each post-secondary institution has a student-run club for students with disabilities. Encourage students with disabilities to run for elected office on campus. Ensure that heritage buildings are made accessible. Question 5: Are there things NEADS can do to ensure students actively participate in its online community? Move to priority 3 for the Web site. Accessibility guidelines have three levels of priority: most people with disabilities can access some of Level 1, more people can access Level 2, and most can access Level 3. The bad news is that although the NEADS Web site is moving to Level 3, the guidelines are also changing! Add testimonials to the Web site, such as, "I have used this site, and it helped me to accomplish…." This could also hold true for companies: "We were looking for someone with this capability, and we found him/her on NEADS." Move forward in the mental health arena. Some students, such as those in the mental health community, do not self-disclose because of a perceived stigma. They are suffering in silence and some have difficulty retaining information in the classroom. Encourage them to come out and seek the help of others. Find ways to make these students feel welcome and ensure confidentiality-perhaps through a special discussion forum. A participant commented, "We interact on MSN anonymously-it could be something like this." Compile a resource list of companies that have demonstrated their receptiveness to hiring people with disabilities. Promote the CampusNet Café. Many students access the CampusNet Web site through the NEADS portal. However, not all student participants are active leaders. There is more exchange in the electronic discussion format NEADS-L than via CampusNet. In order to improve this, a description of CampusNet should be promoted through various listservs, reiterating what CampusNet is and the benefits of membership. When a message is posted on the CampusNet Café, there could be an automatic e-mail that alerts others to the new posting; this will increase the traffic and encourage more to join. Work with search engines to ensure that NEADS comes up in the top ten. Promote the Web site more in the NGO and student communities and beyond. There are special sections of the site, such as Moving On, for high school students moving to post-secondary. Another section is designed to search the disability service centres of universities and colleges across the country and provide detailed contact information and links to school Web sites. Participants discussed the low volume of traffic in the CampusNet Café. Some argued in favour of linking CampusNet Café with the Listserv, so that members on one would automatically be on the other. One participant countered that they serve two different needs-CampusNet Café is for student leaders while the NEADS e-mail discussion forum is for everyone-but another stated that they served the same need. The Canadian Bankers Association started the Ability Edge program as a component of the youth internship Career Edge, said Maryon Urquhart. The program has a contract until December for ongoing funding from HRDC, at which point it will have to reapply for another contract. BMO Financial has helped the program when there have been funding gaps. Initially in six cities, the Ability Edge program is now pan-Canadian and provides for six-, nine-, or twelve-month internships. Interns work for a stipend of $1500 monthly. Six months is deemed to be the shortest length of time required to provide enough experience, while twelve months is seen as the maximum time. After that, participants should move on to fulltime employment at a regular salary. Participating organizations make a significant investment in the interns. They appoint a coach who is available to the intern throughout his or her internship. The organization also makes any necessary accommodations. "I have a great person-Linda Matthews-who works with career counselling," said Urquhart, urging participants to contact Matthews even if a particular job is not on the Web site. Matthews contacts the interns throughout the internships to ensure they have opportunities to network and are settled. Career Edge/Ability Edge works with over 700 employers, universities, and special needs offices. In Ontario, it also attends career days at universities and community colleges to publicize the opportunities that Ability Edge can offer. Urquhart noted that Ability Edge is looking for new ideas of who to partner with, and works with its alumni. In order to be eligible for the Ability Edge program, participants must have a disability, have no career-related work experience, be eligible to work in Canada, and not previously have been an intern. When registering, an applicant is asked if he or she is a person with a disability, but no further questions are asked. Under the Human Rights Code, disclosure is not mandatory. In some instances, participants answer "no" the question, and then do not understand why their application is rejected. Linda Matthews follows up with these participants. Urquhart explained that Ability Edge is a subset of Career Edge. While applicants can apply to both Ability Edge and Career Edge for internships, Ability Edge is designed specifically for people with disabilities, so there is reduced competition for the placements. Host organizations are very knowledgeable, said Urquhart. If an intern has any issues he or she is encouraged to contact the Ability Edge office. There are numerous advantages to the Ability Edge program. Being online, it's easy to register. Internship opportunities are available across many industry sectors, allowing interns to gain experience in their field and not have to grab the first opportunity or placement that comes their way. The program is designed to give new graduates experience in their field of expertise. "There are currently more than 50 internship opportunities listed on our Web site," said Urquhart. "Most employers are looking for college or university graduates, but some are now looking for high school grads. This is good because some people have trouble getting a university degree." Ten organizations focus on Ability Edge. So far, the program has placed 110 interns. Of those, 73% found employment after their internship, and 60% were hired by their host organization. Some of the organizations have a centralized fund for accommodations, so there is no added expense, increasing their rate of participation. Urquhart encouraged anyone-students and potential employers-to contact Ability Edge. Its Web site is www.abilityedge.ca. Navigating the Waters is a national employment initiative of CAILC, funded by HRDC. Susan Forster noted that Independent Living Centres-resource organizations run by and for people with disabilities under the auspices of volunteer boards-first opened in the 1970s in Berkley, California and made their way to Canada shortly thereafter. In 1985 CAILC was formed in response to a call for a national voice. The Independent Living Centres movement is now worldwide; Steve Estey is on the international board. CAILC refers to people with disabilities as consumers, and believes that they have the right to choose for themselves and be an active participant in all decisions that affect them. This philosophy is in direct contrast to the rehabilitation or medical model, said Forster. ILCs view disabilities as a social construct that requires accommodations: the environment, not the person, needs to change. Navigating the Waters is a practical way to put this philosophy in action. Navigating the Waters has been running since 1997 and has helped close to 4,000 people. This fiscal year, the ILC has served over 400 people. Programs operate in 22 ILCs across Canada. Approximately 30% of those who have gone through the program have found employment. Each centre has a career development facilitator who works one on one with participants. Many customers require pre-employment supports-they are just beginning a long journey and require peer support, self-confidence, and work on life issues. Others require skills upgrading, while still others are job ready, and for those participants, ILC staff work directly with employers. The initial pilot project focused solely on employment, but staff soon recognized the need for pre-employment training, said Forster. Some people do not become employed, but can work as volunteers after going through the program, and that is considered a success. Youth employment has only recently been targeted. Forster noted that the majority of those who have registered for the program are in their 30s or 40s. At first the program was restricted to those who were EI ineligible and had been out of the workplace for three years or longer. The program can now work with those who are unemployed, so it is seeing more youth. A small representative sample of participants showed that participants with higher education levels had better job opportunities. Participants who found jobs with a Grade 12 education typically worked in entry-level jobs as general labourers, in home care, the hospitality industry, or in grocery stores. Those with post-secondary education found work with the government, in social services, the tourism industry, or started their own businesses. This points to the need to go out to high schools and encourage students to think about their options, said Forster. BMO (Bank of Montreal) Financial is Canada's largest bank. Stephen McDonnell encouraged participants to think about the environment they want to work in and the explicit corporate values held by that institution. BMO Financial draws its strength from its diversity. It is a supportive workplace where everyone is treated with dignity and respect. "Our communities include people with disabilities," said McDonnell, adding, "Fifty per cent of us will acquire a disability by the age of 60." Federally incorporated businesses that have contracts with the federal government have to be compliant with the Employment Equity Act. When BMO first began recruiting people with disabilities in 1992, the prevailing perception was that they would not be able to do the job, and that the program would cost too much. The organization learned that 80% of accommodations can be achieved at little cost. There is now a central accommodation fund, so no one department takes on a financial burden. BMO Financial believes in experiential learning, internships, and community outreach. McDonnell added that it also believes in the Ability Edge program. Smaller employers are not always able to offer accommodations, so summer jobs-and thus experience-can be difficult to find for people with disabilities. A number of the interns have been offered work by BMO, including a Web designer who is visually impaired. "Disability is not your way in," commented McDonnell. "Employers like us understand the lack of on-the-job experience, but education is key. Your involvement-your volunteer experience-counts as work experience." It is also important to have job seeking strategies, to network, to stay in touch, and to look for employment in a variety of places, and keep a resumé up to date. Mentoring programs work. At Ryerson University third-year students mentor first-year students and people in the community mentor fourth-year students. "Make good relationships with mentors and professors," advised McDonnell. "I often look at references from professors. If a professor remembers you, I have hired from that." McDonnell advised participants to rehearse for the interview and be conscious of how they present in speech and appearance. Understand what the company expects of its employees. Review their literature. Most people leave a job because it was not what they expected. At the job interview, articulate any accommodation needs so they can be provided. McDonnell said that only two or three people in human resources need know about a disability if the intern wishes it that way. On the other hand, if the employer is not told about the need for an accommodation, an employee might arrive at work in a wheelchair only to find he or she cannot get up the stairs. Interns and employees should actively participate in their jobs-ask questions, be flexible, network, and focus on abilities. "My interns don't always get frequent coaching," he said, recalling an instance in which a mentor gave an intern rave reviews and then later said the intern was not performing well. "Not everyone understands people with disabilities, he commented. "If you hear the inspiration speech, a light bulb should go off in your head. Ask for the real answer." BMO is a corporate group built on living values, concluded McDonnell. Those values are apparent in the way the company works and partners in the community. Initiatives put in place to examine the state of the federal government's workplace discovered that in particular, the Science and Technology community was at risk of a significant loss of corporate memory in the coming decade unless the government could actively redress its passive recruitment program. Further study also uncovered major gaps between the Canadian population and certain segments of the workforce, such as people with disabilities, said Mario D'Arcy. "The percentage of people with disabilities in the workforce was much lower than the percentage qualified. The connection was not happening. We knew there were candidates out there. The Action Plan called for various departments to get involved and make a commitment to make their workforce representative. STARR supports a more inclusive workforce and promotes the federal government as a workplace of choice. "We knew we were not representative and that we were facing shortages," said D'Arcy. "We knew we had jobs available and we knew there were people out there. We were missing the links." The federal government now actively recruits employees, including people with disabilities. D'Arcy noted that he was at Laval University for a career fair the previous day. "People apply to organizations they know, so we go out and tell them who we are." Each year the federal government offers 15,000 jobs to students-5,000 for cooperative work terms, and 10,000 for what used to be known as the summer employment program, but now operates year round. Some managers looking exclusively for students with disabilities. "You would not believe the amount of requests left unfilled," said D'Arcy. "Nine times out of ten, we can't find anyone to fill the position." Once in the program, students can be re-employed during subsequent work or summer terms. If a job offer is in another city, the federal government will pay travel expenses. Students who participate in either program can be appointed to a federal government job upon graduation without having to go through a selection or competitive process. Regardless of the program, preference is given to Canadian citizens. Hiring preferences are listened to-the government wants students to graduate with work experience. For students who have not been able to access the 15,000 jobs, the federal government also has a post-secondary recruitment strategy. New graduates are brought into the federal civil service at an officer or a junior level. Depending on the education level achieved, the starting salary can be as high as $60,000. This program does not require any experience. D'Arcy said that the major complaint he hears about federal government recruitment is that graduates apply and then never hear another word. "Most of the time it's because managers are looking for people with experience. No student has four or five years of experience at graduation." This program is designed to address this issue. Once again, managers often request people with a disability. New graduates can apply either by cutting and pasting their resumés onto the Web site (valid for two months) or by applying for specific jobs posted. Jason Mitschele mentioned the youth employment internship program offered by HRDC, which provides a chance for youth to work in a foreign country. Noting that he had participated in the program, Mitschele encouraged those who want to travel and get work experience to apply. Lana McGee told participants that Line 1000 Placement Services is a non-profit employment agency for people with disabilities. It receives funding from HRDC and Ontario Ministry of Community and Social Services. In order to be eligible, participants have to be out of school and actively looking for work. Line 1000 sees 600 people annually. Each person is assessed individually. Those who need skills enhancement can work with Line 1000 staff, be referred to another agency, or work with a job developer. Line 1000 helps participants develop resumés, prepare for job interviews, set up networking opportunities, advocate to employers, and establish accommodations. McGee noted that Line 1000 also offers a job search workshop that lasts three days. Participants can go through a video-taped mock interview, and discuss how and when to disclose their disability, or determine whether or not they need to. The double cohort in Ontario has meant that Line 1000 now sees many more youth who are out of school, and quite a few of who did not make it into university. The needs of youth are very different, noted McGee, reminding participants that the effects of the double cohort will be felt for years to come, particularly three to four years from now when students graduate from university and college in record numbers. Line 1000 has a new pilot project for youth that runs until May. McGee expressed the hope that it would continue past its initial funding. "Over the years we have worked on different projects: retraining programs for people to work at Wal-Mart, and in partnerships with the Canadian Council on Rehabilitation and Work, a program for people to work in the hospitality industry," said McGee. An HRDC-sponsored program helps people to apply for short-term courses to upgrade computer skills. "More youth are coming to us," she concluded. "We want to make the sign that much bigger to let youth know we are here." A participant asked if the Ability Edge and Career Edge programs have an age cut-off. Urquhart replied that as the HRDC funding is for youth initiatives, participation is capped at age 30. Some other funding comes from host organizations that do not have an age cap. The Ability Edge program is designed for those who do not have much employment experience in their areas of expertise. McDonnell added that BMO Financial had 46-year-old intern who went on to full-time employment. Another participant said she would like to see the Ability Edge program expand into the social service area. Maryon Urquhart concurred, noting that the program is marketed to all employers, but most of the uptake has been from federally regulated organizations and in particular, the financial sector. She asked anyone with a potential employer to contact her. "My experience has all been developed through student leadership," said a participant. "My resumé does not read like I came out of school. Many in this room are like me." McDonnell said that he is good at reading resumés and understanding gaps. His company has brought in interns who have not worked for ten years but need to re-enter the workforce. D'Arcy said that he would gladly accept resumés from anyone with a disability, regardless of the area of study or the disability. Health Canada alone has to hire 53 employees with disabilities in order to be representative. "I will gladly do some marketing on your behalf," he promised. Asked if students on a reduced workload could apply to Ability Edge for part-time work, Maryon Urquhart said that if an intern's accommodation is the need to work part-time or if an intern required time off for appointments, he or she should make that clear at the time of the interview. Mario D'Arcy replied that there is room for part-time work in the federal government. A participant with an invisible disability stated that there would be no overt public relations in hiring him. He asked about success rates-do they vary according to the type of disability? Are people with certain disabilities placed in certain fields? McGee replied that the majority of people who come through Line 1000's doors have a hidden disability, but she did not know success rates. McDonnell said that BMO Financial does not track results by disability, so he could only give anecdotal evidence. Employers often do not know an employee has a hidden disability until there is a problem. "If one has the skill set to do a job, we will work it out. We never lower the bar of excellence, we just make the bar accessible," he said. D'Arcy replied that candidates self-identify. They do not have to fill out the form, but if they don't, they will not be recognized, have certain rights, and be eligible for certain jobs. Any information provided is confidential and stays within the human resources department. Forster said that she had not done an analysis, but knew that both visible and invisible disabilities were represented in the Navigating the Waters Program. Often though, the severity of a disability can make the difference in finding employment. For example, "I have a better chance with some visibility of being employed than someone who is totally blind. If you are a paraplegic, you have a better chance than a quadriplegic," she said. "Severity is my guess. Also, I am aware that certain disabilities are viewed more favourably than others, although this is not something we like to talk about." Citing the Statistics Canada, Participation Activity Limitation (PALS) survey, McDonnell noted that people with multiple disabilities face more challenges in the employment market. A participant asked if anyone was looking at the significant portion of disabled people who "fall through the cracks." McGee replied that there are myriad services for certain disabilities while others, such as mental health problems, lack services. Although ILCs advocate for the developmentally delayed, there are still few services for this group. Asked if an applicant to the federal government's post-secondary recruitment initiative is automatically considered for STARR, D'Arcy said that STARR is primarily a promotional or marketing initiative, and is not solely for scientific and technical groups. Anyone can participate in the public service recruitment strategy. The key, under the STARR initiative, is to self-identify as a disabled person. Without that information, a match cannot be made with those looking to make their departments more representative. Another participant asked if those who apply and self-identify as disabled are automatically hired. D'Arcy replied that that happens in many departments, particularly the sciences. Many other departments are not representative and are also looking to increase the number of staff with disabilities. A participant asked how the stipend for the Ability Edge program relates to income security programs such as long-term disability. Urquhart said that it is examined on a case-by-case basis, and in some cases the stipend can be reduced in order for the income security to continue. A participant from Canada Post encouraged everyone applying for a job to self-identify. "It could make the difference between getting a job or not," he said. Question 1: What can employers do to ensure that students with disabilities learn about job opportunities? Hire people with disabilities in their human resources departments so that those doing the hiring are aware of the issues and problems. Be flexible in terms of the job search process. Be flexible to take that resume in other ways than online. Question 2: What skills are the most sought after by industry today? Emotional intelligence: a new buzzword that means to be mature and respond in an adult way. Question 3: Would you disclose your disability before or after, or maybe not at all? If not, it may be from fear or indicate that the company has a bad attitude or culture. Unless a person discloses, it could put him or her at a disadvantage. The employer might not know, for example, that the applicant is hearing impaired, and not understand when a question is answered incorrectly. Disclosing before indicates that the applicant is honest, informed, and an open communicator. Jason Mitschele thanked Frank Smith for all his efforts in planning the Ottawa Student Leadership and Employment Forum, and the speakers for "making it look organized." He also thanked Chris Gaulin and Michael Sanford for assistance with the technical aspects of the meeting. Mitschele thanked Human Resources Development Canada (HRDC) for its sponsorship. A participant commented that although she has worked for HRDC for 13 years she is new to the equity field, and came to the forum to learn more about the issues. "I'm glad to see the money HRDC contributes is well used and administered. It shows that it makes a difference," she said. "Keep up the good work. I am really, really impressed."